Matt Skelton graduated from the Royal Academy of Music in 1994. Since then his career has encompassed a diverse range of music. He has accompanied Harry Sweets Edison, Scott Hamilton, Conte Candoli, Nick Brignola, Harry Allen, Warren Vaché, Michael Moore and both Bucky and John Pizzarelli. He has also played with Dave O’Higgins, Alan Barnes, Don Weller and Stacey Kent, and regularly appears with the Hallé, The BBC Concert Orchestra and The Britten Symphonia accompanying soloists such as Maria Ewing, Claire Martin and Sir Richard Rodney Bennet. 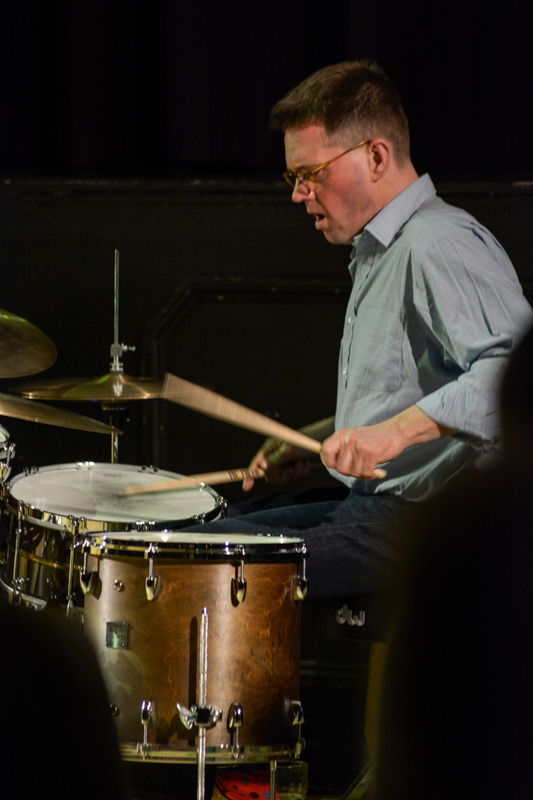 He is the drummer for the John Wilson Orchestra with whom he recently recorded the soundtrack for the major motion picture “Beyond The Sea” starring Kevin Spacey. Big Screen is a trio with an enviable pedigree created with the brief to play music from the movies. The trio is: Matt Skelton on drums, Tom Farmer on bass and David Newton on keyboards. His playing recalls the piano trio recordings of music from the movies, with the likes of Ed Thigpen and Shelly Manne. Whether using brushes or sticks, Skelton displays talent and musicality. He understands the legacy of the music and of his instrument. He frequently plays with groups led by clarinetist Mark Crooks, saxophonists Christian Brewer, Matt Wates and Dave O’Higgins. Matt formed his own co-led Big Band with saxophonist Colin Skinner. The Skelton & Skinner All Stars made their Ronnie Scott’s debut in November 2009.